Marie Stopes Clinic nestles in the leafy suburbs of Buckhurst Hill, Essex. The refurbishment of the clinics 3rd floor was carried out in conjunction with the requirement for disabled access in accordance with part M of the DDA. 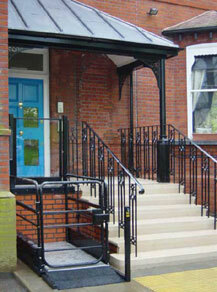 This fine Victorian building was blighted by a more recent addition of a timber glazed porch and it was decided to incorporate the disabled access into a project to provide an entrance more in keeping with its heritage. A lead covered canopy, cast iron structural posts, ornate railings and stone steps are part of a fine addition to this property.